Catoosa's Blue Whale is one of the most recognizable Route 66 roadside icons and is featured in guidebooks around the world. Once a favorite swimming hole, the site now offers a nostalgic photo-op along the Mother Road. Through the eyes of a child, Tucker Tower can seem like an ancient castle standing tall and prominent, an icon on the shores of Lake Murray in Ardmore. Today, it still proudly stands like a guardian of Lake Murray State Park, Oklahoma’s oldest state park. Located on the south shore of the lake, the tower is shaped like a truncated obelisk. Built by the Works Progress Administration, Tucker Tower was originally intended to be the summer retreat for the governors of Oklahoma; however, due to budget woes, it wasn't completed as designed. Tucker Tower is now a nature center featuring local artifacts, nature programs and activities organized by a state park naturalist. The tower is the perfect place for a whole new generation of kids to create their own castle dreams. Just a few miles north of Lake Murray, a 77-foot waterfall featuring clear, cool water and two natural swimming pools make Turner Falls Park a bit like paradise to kids of yesteryear and today. Located on Honey Creek in the Arbuckle Mountains near Davis, the park still draws thousands of visitors each year for swimming, hiking and camping. Arbuckle Trail Rides at Turner Falls Park offers half-day and full-day trail rides for recreational riders in the rugged Arbuckle Mountains on some of the largest and most historic ranches in the area. Each ride is customized to fit the needs and riding experience of each group. Located on the edge of Chelsea on historic Route 66, visitors will find the world’s largest concrete totem pole in Totem Pole Park. Completed in 1948, the 90-foot-tall structure is anchored by a giant concrete turtle and is an irresistible roadside attraction and magnet for photo-ops and touristy memories. Scattered around the property are several smaller totem poles and the 11-sided Fiddle House, home to a small gift shop and a collection of hand-carved violins. The fiddles and park are the work of Ed Galloway, a teacher from Sand Springs who retired to Foyil in 1937. Discover another popular Route 66 stop by visiting the Blue Whale near Catoosa. This fantastical statue once served as the centerpiece of an amusement complex that included a roadside zoo and a replica of Noah’s Ark. 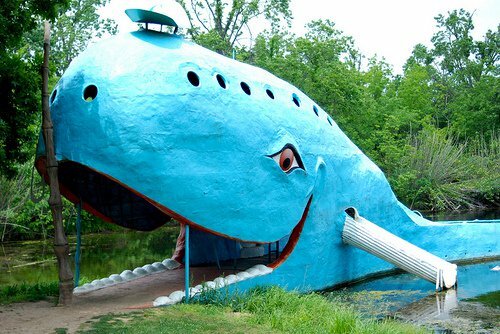 Built by Hugh Davis, who celebrated his anniversary in 1970 by building the concrete whale for his wife, Zelta, the smiling face of the whale still welcomes Route 66 travelers year-round. Have a picnic under the trees by the surrounding pond, take lots of pictures and create some new memories to go with the old ones. The smiling face of the whale still welcomes Route 66 travelers year-round. Visit the Arkansas River Historical Society Museum in Catoosa, where permanent exhibits explore the history of the river, the McClellan Kerr Arkansas River Navigation System, steamboat lore and archaeology. Don’t miss the motorized model of a lock and dam and the Oklahoma Maritime Education Center, which includes the Charley Border Towboat. If the native red sandstone steps of the righteously hip Zoo Amphitheatre in Oklahoma City could talk, they’d have plenty of stories to tell. Through the years, national acts such as the Grateful Dead, Dire Straits, Sting, Neil Young, Joni Mitchell and the Flaming Lips having graced the Zoo stage. The Oklahoma City Zoo Amphitheater was the first structure in Oklahoma City built by the Civilian Conservation Corps in 1936. Adding to the overall eccentric vibe of the place, the first performance at the Zoo Amphitheatre was "The Circus of 21 Death-Defying Acts." Today, the historic amphitheater continues to serve up concert memories each summer, so check for upcoming acts. The Gold Dome Building, located on the southern end of Oklahoma City’s Asian District, is famous for its unique architecture and for being a major landmark along historic Route 66. A geodesic hemisphere constructed in 1958 as a Citizens State Bank, it was slated for demolition several years ago, but preservationists intervened and it now houses several offices and a restaurant. The Gold Dome Building was the fifth geodesic dome constructed in the world and was described as one of the nation's most revolutionary bank designs at the time of construction. A vintage Tulsa icon, Weber's Root Beer has served homemade root beer, delicious hamburgers, onion rings and hand-cut fries since 1933. Located on Peoria Avenue in Tulsa's Brookside District, Weber's bright orange sign promises superior root beer; their closely held secret root beer recipe with 14 natural ingredients dates all the way back to the 1800s. In addition to creating legendary root beer and mighty fine hamburgers, Weber's founder, farmer Oscar Weber Bilby, is credited with creating the first business-grade restaurant grill in 1891. Hit the roadside attraction jackpot with the legendary giant Golden Driller statue on Tulsa’s fairgrounds. The iron and concrete 76-foot statue, with his gigantic body towering above an actual oil derrick, symbolizes Tulsa’s rowdy oil boom past and lives up to his reputation for being an iconic roadside stop. Declared Oklahoma’s official state monument in 1979, the Driller has occupied the same spot for more than 40 years, making him the perfect landmark for reviving golden childhood memories. The restored and re-erected neon Meadow Gold sign, a Tulsa and Route 66 icon since the 1930s, is located at 11th Street and Quaker Avenue, just a few short miles away from the Golden Driller. Plaques at the site explain the history of this one-of-a-kind historical sign.